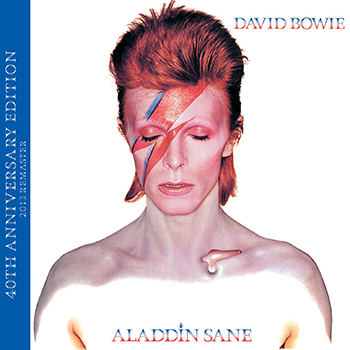 David Bowie’s landmark album, Aladdin Sane, his 1973 follow-up to 1972’s The Rise and Fall of Ziggy Stardust and The Spiders From Mars, has been digitally remastered by Ray Staff at London’s AIR Studios for a new 40th Anniversary Edition released on April 16th by Virgin/UMe. The commemorative edition is available on CD and digitally, including iTunes. Originally released by RCA Victor on April 13, 1973, Aladdin Sane was David Bowie’s sixth album, engineered and co-produced by Ken Scott and Bowie. This was a just after Bowie’s Ziggy Stardust had made him a massive star in the U.K. and he was touring extensively in the U.S., where most of the album’s songs were written while he was on the road. Recorded at Trident Studios, London and RCA Studios, New York and Nashville, between October 6, 1972 and January 24, 1973, it was be to be the last album on which the Spiders’ line-up of Mick Ronson (guitar, piano, backing vocals), Trevor Bolder (bass) and Mick ‘Woody’ Woodmansey (drums) would appear. Aladdin Sane saw him create a rockier, more frenetic album than its predecessor, with the Rolling Stones a possible influence on album opener “Watch That Man” and a rendition of their song, “Let’s Spend the Night Together.” Elsewhere, Muddy Waters’ audio fingerprints could be heard in the riff of the U.K. #2 single “The Jean Genie,” and the “futuristic nostalgia” of “Drive-In Saturday” — which charted at #3 in the UK — was inspired by 1950s doo-wop. “Cracked Actor,” possibly Bowie’s most decadent moment, was written after he had toured Hollywood Boulevard, translating the images and environment into raw rock ‘n’ roll. The recent addition of Mike Garson and his stellar talents infused some of the album’s key tracks, in particular the title track with its dissonant improvisation, the Brechtian cabaret of “Time” and album closer “Lady Grinning Soul” with an edgy, schizophrenic quality. UK pre-orders for the album were a staggering 100,000 (not seen since the heyday of The Beatles). It was Bowie’s first UK number one album, and it reached number 17 on Billboard’s U.S. albums chart. First and foremost I couldn’t see that he’d ever be as big as he turned out to be. He was a nice guy and had a certain amount of talent. That was it. Ray Staff at London’s AIR Studios has remastered the album’s 40th anniversary edition. Staff cut the original LP during his time at Trident Studios and he has received plaudits for his remastering of last year’s Ziggy Stardust 40th Anniversary Edition. During 1970 and into the summer of ‘71 Rodney Bingenheimer, now a longtime KROQ-FM DJ, helped introduce Bowie to the regional FM radio community of Los Angeles when he was working for Mercury Records in Hollywood. The impact of Aladdin Sane was not lost on Rodney then or now. “I did FM promotions for David Bowie when he was on the label for The Man Who Sold The World when it was being released in the U.S,” Bingenheimer recalls. “(Record producer) Tom Ayres let me borrow his Cadillac and I drove Bowie all over L.A. and Hollywood. This was when David had long hair and wore a dress. We went to KMET-FM. “We drove to KYMS out in Orange County. I took him to Lewin’s Record Paradise on Hollywood Boulevard, an English import shop. The owner flipped out when David came into the store. Autographs. The whole thing. Bowie loved America. I arranged a party for Bowie up at attorney Paul Fegan’s house. David played some songs at the party. 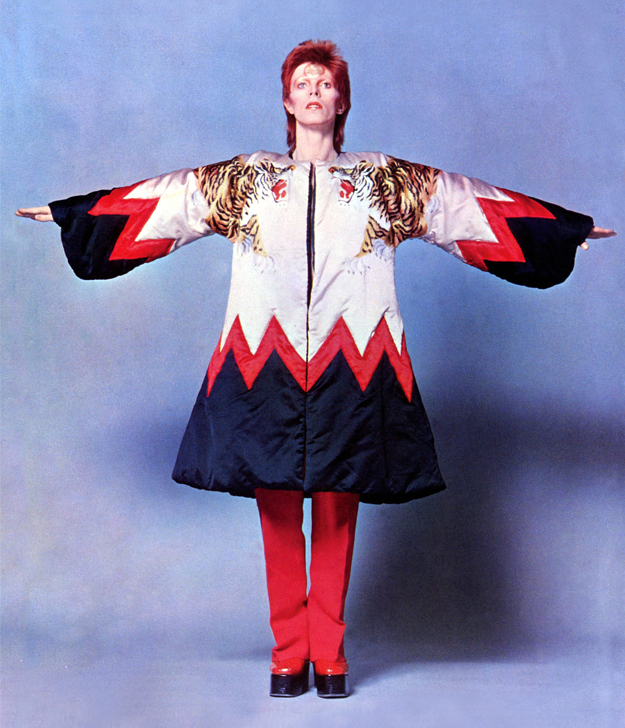 I loved the albums David did for Mercury, later reissued on RCA after his Ziggy Stardust album happened,” he proclaims. “I went to London in the summer of 1971,” Rodney remembers, “and David invited me to the Hunky Dory recording sessions at Trident. David gave me the idea to start a club in Hollywood, and I eventually had Rodney’s English Disco on Sunset Boulevard. I attended the Ziggy Stardust show at the Santa Monica Civic Auditorium and that LP took it to a whole new level. Aladdin Sane then followed. That album has some of his finest recordings. ‘The Jean Genie’ was basically an anthem in my club and packed the dance floor. ‘Watch That Man’ was always requested when I spun at the turntable. Lulu recorded a great version that David and Mick Ronson produced. ‘Cracked Actor’ which is about Hollywood, Sunset and Vine is mentioned in the lyrics, blew my mind. RCA Records was down the street and I played advance white label copies of his records and acetates. Aladdin Sane was the album that Cherrie Currie worshiped and influenced her decision to start a band that became the Runaways. Producer and engineer Ken Scott on David Bowie’s Aladdin Sane. (Ken Scott was one of the five main engineers for the Beatles, served as the engineer on their White album as well as George Harrison’s All Things Must Pass solo album. Scott engineered Bowie’s Hunky Dory LP, and engineered and co-produced David’s Bowie’s The Rise and Fall of Ziggy Stardust. Q: You’ve just returned from The Victoria and Albert Museum in London where the first international retrospective of David Bowie’s career, David Bowie Is, was opened in March. Over 50,000 tickets have been sold already through August. In 2014 the exhibit comes to the United States, including the Los Angeles County Museum of Art. 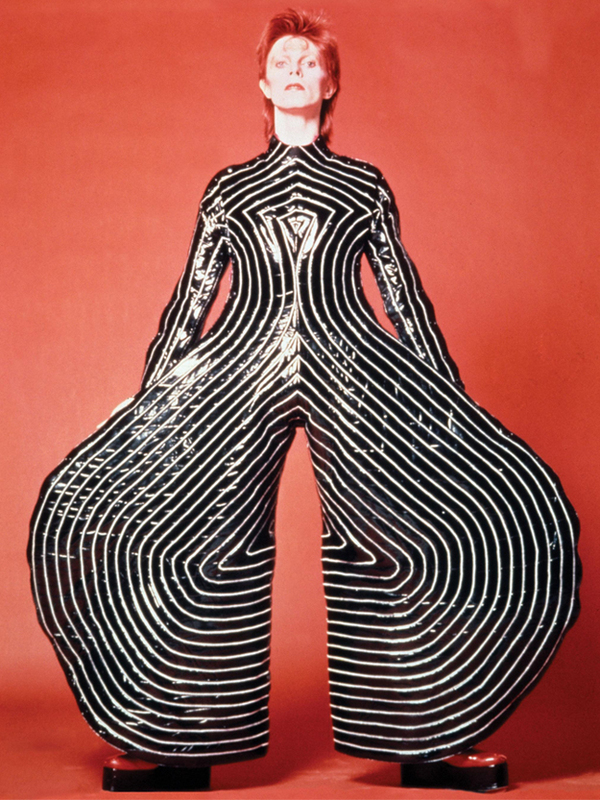 Ziggy Stardust bodysuits and photographer Brian Duffy’s album cover of “Aladdin Sane” are included with 300 items. In May of 2013, the Britweek event was held in Los Angeles. On May 2, at the Mr Musichead Gallery in West Hollywood, Bowie was celebrated through a visual retrospective by famed photographers Duffy, Mick Rock, & John Rowlands as well as memorabilia. A: I think David is probably a hoarder in life as he is in his brain. I say that because that’s how he came up with some of his unique stuff. It was pulling things in from his past that he’d heard and really liked and melded them into his own concept. So he was storing lots of things in his brain that he was bringing into his music. And I think it’s the same in his life. Which was brilliant. My wife and I were at the opening dinner. We heard that 1,000 advance ticket sales for an exhibit is considered good. David’s red platform shoes that were always next to me in the recording studio at Trident are now on display! “First and foremost I couldn’t see that he’d ever be as big as he turned out to be. He was a nice guy and had a certain amount of talent. That was it. It wasn’t until we started to get Hunky Dory together that he was starting to sort of find his own way, not having his way directed by management, that I suddenly saw a unique talent. But I could never see how big as he turned out to be. I don’t think you can do that with any artist. I get the occasional email from him. The last one was when he turned 65. Q: I dug David Bowie when he was first on Mercury and heard him in 1969. Saw him play in the U.S. in 1972 as “Ziggy Stardust.” Here we are 40 years later talking about him. Do you think his music of 1971-74 would have had the same social and commercial impact, even now on reissue, without all the visuals, self-designed marketing, costumes and TV appearances? A: The music was good. The performances were suburb. Look, musically it would stand up. Whether it would have reached the masses that he did without TV, videos, a whole different thing, I don’t know what he would have done. “But I don’t think he would have become as big as he did without the whole visual side of it. In England, the big turning point that everybody points to was his Top of the Pops appearance doing ‘Star Man.’ That is what apparently turned everything around in England. And I did the session” and then saw it on television. To many, that ‘Star Man’ appearance was like the Beatles in the U.S. on The Ed Sullivan Show. It seems that way, because no one had seen a rock, pop musician that flamboyant. The androgyny at that point, putting his arm around (guitarist) Mick Ronson and all of that, was pushing something they hadn’t seen before. “Now, you have to remember, in England, we were raised with huge stars that cross dressed. We were raised on pantomime of Christmas, which always had the lead male played by a female and a strange old woman was always played by a man. We had been raised with that. But suddenly seeing a rock star sort of pushing more in that direction I think shocked a lot of people and made them sit up and take notice. And that whole thing was something that was set up so brilliantly. My feeling is more by management than it was by David. It went back to when Hunky Dory came out. The cover for a kickoff. He’d gotten on the front page of The Sun in England. This mishmash of sexuality. He also knew how to work the media. A: “The Jean Genie” had been recorded in New York. RCA needed a single, and I had nothing whatsoever to do with the recording and the initial mixing. It was put out as a single and then I remixed it for the album later. David enjoyed recording in the States and I got the phone call and he wanted to start the new album in New York. So I flew over and worked on it. We cut a few tracks and I think only two of them ended up on the album. “One of the things in looking back on this period that has fascinated me was that I didn’t realize it until recently, was the way piano changed David’s music. “It occurred to me how a certain amount of David’s transformation, you take ‘Hunky Dory which had Rick Wakeman on it, who is a fantastic, a bit more classically-oriented pianist, ‘Life On Mars,’ very good at rock ‘n’ roll but his training was more classical. His piano on ‘Life On Mars’ is unbelievable. Then you go into Ziggy, with Bowie and Ronno playing. On Ziggy it’s really simplistic because they weren’t pianists. Neither of them particularly awe-inspiring. So the piano is very simple on Ziggy. But then you to Aladdin Sane, Mike Garson is on board, and it completely changes the whole feel of it. Now how much of that is pre-planned by David to move it into a different direction and how much is their effect on the way that we recorded I don’t know. Mike was on the Live Santa Monica Civic Auditorium ’72 concert but always pushed in the background. If you watch the ’73 Hammersmith Odeon Ziggy movie he’s not really shown. “The Beatles kind of grew by using different instruments. Bowie changed and grew by using different people playing. It’s bizarre. His use of keyboards really does sort of cover his growth. And how he changed. “I regret very little of what I did during my entire career, but the mix on David’s ‘Watch That Man’ is one of the things I do regret. Today I would have had the vocal up more. Back then, after doing different mixes with the vocal up more for both management and record company. It was back in the day, a straight stereo mix. I did it the way I felt it should be. Which is today’s. Then I had complaints from the management so I went in and did another mix with the vocal up and they came back and agreed with me it was more powerful with the vocal down. Then the record company did the same thing. I went in and yet did another mix with the vocal up and they agreed with me. For whatever reason today, I don’t like it with the vocal down. But there must have been good reason because management along with the record company and I agreed. Q: From working with the Beatles and engineering their “White” album and other sessions, can you discuss something you subsequently brought into the work with David Bowie? A: I can’t pinpoint anything, other than in working with the Beatles I got to experiment a lot and go through microphones and find out which mikes I liked for different things. So that moved on from there. Also, the learning experience with the Beatles is anything goes. It doesn’t matter if it’s a really bad sound as long as it fits. “I look at the harmonica on ‘Cracked Actor.’ Like most things, we tried ‘Cracked Actor’ with a straight harmonica, it sounded so weak, along with bass, drums and guitar. Then I remember we recorded a little more guitar on top. Then David wanted to put the harmonica on it. And he went down and started to play but it sounded so weak compared to the track. So I said, ‘Let’s try putting it through Ronno’s 100 watt Marshall amp.’ And cranked it. And it’s just nasty. That’s when everything started to really come to life. It was so nasty. It all worked. “And with ‘Panic In Detroit.’ The background singers. David had and hopefully still has, this knack with coming up with different background parts than most people would. “David had become more of this ‘Ziggy’ character as we’d come to recognize what Ziggy was kind of thing. But still, sweetheart of a guy, ultimate professional in the studio. He was much more confident. He could plan things out but also do impulsive things. “David allowed me complete freedom. He never once said, ‘I’d like it a bit more like this…’ The only comment ever was going from Hunky Dory to Ziggy, that’s he’d like it ‘a bit more rock ‘n’ roll.’ David understood collaboration. “Look, the team of us, David, Mick, Woody and Trevor was an incredible period. It really worked well. A: Yes. He was successful by then. He felt he could push the envelope a bit more. I think his influences were coming a little more from the modern situation. I think he was influenced by Bryan Ferry, which became very apparent on ‘Pin Ups.’ But he’s moving more in that direction. As music has changed around him, he’s keeping ahead of it slightly. Q: Why is there still a constant demand for older music and reissues? You are constantly asked about the Beatles, David Bowie, and Duran Duran. A: In my opinion it’s because how bad everything is out there now. The vision of music moving forward has disappeared. And it’s disappeared for a couple of reasons as far as I’m concerned. One is record companies. The major labels started to be run by accountants and attorneys. Not music people. And that started to turn things around. Plus the fact they’ve reached the point where they realized there’s money to be made here. So it all became about the bottom line. There’s virtually no artistic freedom left for a recording artist with a major label these days. The other thing is, radio has become a genre and niche oriented business. And so what I think is happening is that people are just listening to the kind of thing they want to listen to so they are not listening to anything outside they can bring to the table kind of thing to make it different. It’s just become boring. There’s nothing to talk about now because it’s all been said before. Q: You started in the analog vinyl world and have watched your work become cassettes and then CD’s. Pressing plant demands, nice and available sounding LP’s, as well as consumer vinyl purchasing has had a slight increase in sales this century. A: My feeling about CDs is that they had to come. Vinyl, because of the rate we were using vinyl back then, the quality of the vinyl was getting worse and worse. So if we continued at that rate and not found CDs I think the music business would have ended because the sound would have been so atrocious. So something like CDs had to come along. 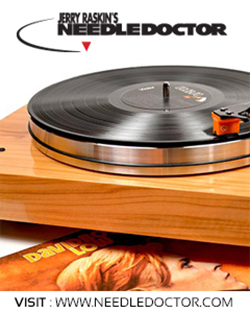 Now, it’s easier to get better quality vinyl because we’re not using it as the same rate as we did back then. 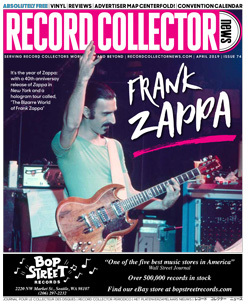 “My problem is that the record companies chose the lowest common denominator if you like, with CDs, the quality which was going to be on CDs. And they’ve failed to upgrade as technology has upgraded. And so the quality of CDs now is probably as bad in comparison of what it could be. The quality of CDs now is about as bad as the quality of vinyl was when we were really pushing it out. I don’t mind the CDs if we could get better quality. 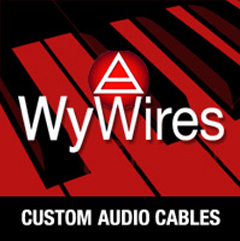 Q: Your catalog of work done over nearly 50 years is now heard on AM, FM and satellite radio. If you ran the record and music business, what would you do? A: First and foremost, as far as I’m concerned, there needs to be a level playing field between Internet radio and terrestrial radio because the future is Internet-driven. And we have to get back to the sixties and seventies style DJs who chose what they wanted to play and were personality-driven. You got to know a DJ by what he played and what he said on the radio, and you would go out of your way to listen to that particular DJ because you know he would bring some great new music to you that you would never necessarily have heard otherwise. “FM radio when it began did impact me as an engineer in the one respect in moving from mono to stereo. We did everything for mono. For an engineer, a mono mix was really easy. Then you had to do stereo and you really had to think about it. And it was a lot harder. These days, stereo is easy. Don’t ask me to do a mono mix. It would take me days. You just get used to the parameters you are working in. I don’t think he would have become as big as he did without the whole visual side of it. “In the last part of the sixties in England, we had Pirate Radio. They were open to the new music. They weren’t stuffy like the BBC. EMI was much the same way. We were coming out of World War II, and there was a certain mentality coming out of that. And then suddenly, we as kids, the post war generation, started to realize, number one, how many of us there were, and number two, how much power we had. And it was that that started to change things. “If anything, to me, for me, it just shows that we haven’t moved forward musically. And that music is more a disappointment today than anything. I see it from a totally different place. Q: And now we have the 40th anniversary edition of “Aladdin Sane.” Why does the initial mas-tering and the new remastering sound so good? You began your recording career at EMI Abbey Road preparing lacquers in the mastering laboratory. Los Angeles native Harvey Kubernik is a music journalist for over 40 years and the author of 5 books, including “This Is Rebel Music” (2002) and “Hollywood Shack Job: Rock Music In Film and On Your Screen” (2004) published by the University of New Mexico Press.